When the Twins dismissed manager Paul Molitor at the end of the season, it set into motion a major overhaul of the coaching staff that's still underway. Read on for a comprehensive breakdown of who's still in, who was sent out, and which names are worth monitoring for the newly vacant roles. It's clear that Minnesota's front office is placing an emphatic priority on optimizing this unit. "In my opinion, a staff is not just a manager and a bunch of guys," GM Thad Levine told The Athletic. "We hope to put together the best staff we possibly can." The Twins reportedly vetted up to two dozen candidates in their managerial search, so there's no question they'll turn over every stone in surrounding him with the right pieces. Let's get up to speed on what the coaching staff currently looks like, and who to keep an eye on for the open spots. As such, it makes sense to offset this deficiency, so we'll presumably see the Twins bring in seasoned perspective with at least some of their coming hires – especially at bench coach, where the front office is envisioning a highly collaborative, almost symbiotic relationship. Incumbent Derek Shelton was a finalist for the manager nod before falling short of Baldelli, who must have blown away Falvey and Levine because the two top execs raved about Shelton's performance while interviewing. Shelton now appears to be one of the top choices for Texas' managerial opening, but if he misses out, Falvey and Levine are clearly hoping he'll return to his previous gig. And while the 48-year-old may not be jazzed about returning to bench coach duties after coming so close to the top job. twice, the Twins are trying to make it as appealing to him as they can. Baldelli's bench coach will be instrumental in helping the rookie skipper acclimate to a new organization and a new world of responsibility. Shelton, who managed for three seasons in the minors before coaching in various capacities for three major-league teams, is ideally suited for the task, especially because of his existing relationships in the locker room (not to mention with Baldelli, from their days in Tampa). I think the odds are strongly in favor of Shelton remaining as bench coach. But if the Rangers pluck him away, the Twins will need to pivot elsewhere. Both James Rowson and assistant hitting coach Rudy Hernandez were kept on, as perhaps the only ones to survive this exodus (pending Shelton). Rowson interviewed for the manager job so evidently the front office views him highly. Hernandez has strong rapport with the Spanish-speaking players on the team. In terms of on-field results, the instructional duo doesn't have a ton to show; Minnesota took significant steps backward in key offensive categories this year. But in so many cases – Byron Buxton, Miguel Sano, Jorge Polanco, Jason Castro, Brian Dozier, etc. – there were deeper issues at play. And we did see some successes, most notably rookies Jake Cave and Mitch Garver. So, I'm good with these two being kept on. They'll have plenty of new colleagues. Garvin Alston's tenure with the Twins lasted just one season. The team is quickly changing gears after bringing in the former A's bullpen coach one year ago, even though the pitching staff was altogether solid in 2018. It sounds like the new manager will have significant influence over this decision. Per Dan Hayes of The Athletic, a "source suggested that Baldelli might want to bring in his own guy at pitching coach, a position he will likely rely upon heavily in his first season as the club’s manager." One name that's been brought up (again, by Hayes, who's been very tuned in and is a must-follow on Twitter) is Charles Nagy. He brings the experience, both as a pitcher (he spent 14 seasons in the majors) and as an MLB pitching coach (three years with the D-backs, three years with the Angels). He has recent ties to Falvey, having spent the 2015 season as Special Assistant to Player Development for Cleveland. Nagy spent the last three seasons in Anaheim before being ousted along with manager Mike Scioscia in a purge of the Angels coaching staff. But he has a solid reputation around the game. He's credited with helping left-hander Patrick Corbin (a potential Twins offseason target) develop during his time in Arizona. Considered a laid-back type and an excellent communicator, Nagy seems stylistically similar to Rowson, and his breadth of experience would surely be invaluable to Baldelli. This match would make a lot of sense. But if it doesn't happen, another name to keep in mind is Carl Willis, who has twice interviewed for Twins pitching coach vacancies (losing out to Alston and Neil Allen). The Cleveland connection is present there as well, obviously. In terms of people with connections to Baldelli, Stan Boroski is the Rays bullpen coach and has been for seven years. After four years in the position, Eddie Guardado is out. It's anyone's guess where the Twins might go now. As the nature of major-league bullpens evolves before our eyes, presumably Minnesota will opt for a new-school mind, capable of preparing his staff for experimental usage patterns and non-traditional roles. Stu Cliburn seems most likely among internal candidates. Currently the pitching coach at Triple-A Rochester, Cliburn is a well-known commodity in the organization with nearly three decades of tenure. But despite his entrenchment, the 62-year-old is not closed-minded. He'd be a solid anchor of familiarity on a staff that figures to be crowded with newcomers. Pete Maki, the former Duke pitching coach who took over for Erik Rasmussen as minor-league pitching coordinator a year ago and led the charge with implementation of the opener method, is another possibility from within. A potential sleeper to watch: Matt Belisle, who was essentially serving as pseudo-bullpen coach for much of this season. 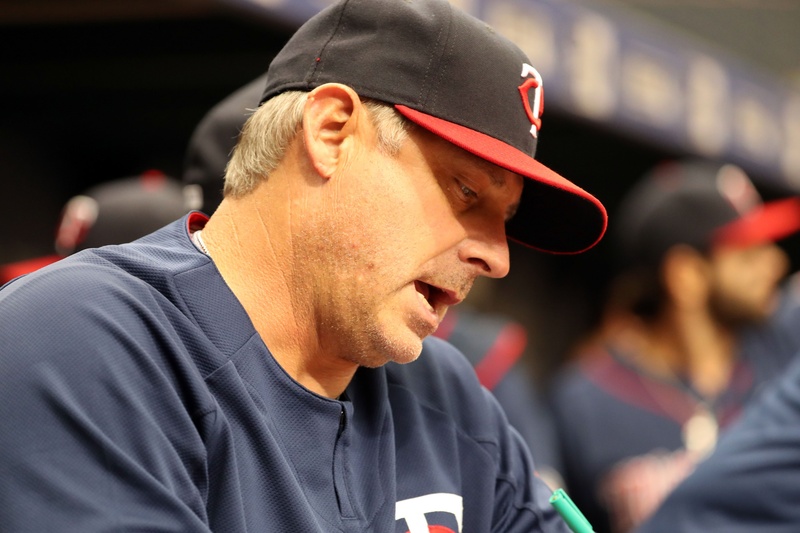 The Twins are moving on from both first base coach Jeff Smith and third base coach Gene Glynn. If you're looking within, Tommy Watkins stands out as a great option. He managed the Double-A team this year and is currently managing the Salt River Rafters in the Arizona Fall League. "I am humbled that the Twins trust me with this role," Watkins told our Seth Stohs last month. While the Twins have severed ties with holdovers at almost all levels, Watkins just continues to rise. He is extremely well liked within the organization. One thing to consider is that first and third base coaches tend to have specializations in terms of player instruction. Smith often worked with the catchers, and – given the rawness of Garver – it's only logical the Twins will seek out an individual who can teach at that position. I've got a feeling about clubhouse favorite Chris Gimenez. Another consideration in this search: Baldelli stated during his introductory presser that he's "looking for a very diverse staff." "One of my best friends, who was just named manager of the Blue Jays [Charlie Montoyo], I’ve seen him relate to players in ways that I can’t. Although I would try very hard in some ways, I see him just step up and do things." The Twins will have at least one Spanish-speaker on the staff in Hernandez. But it wouldn't be surprising to see them add another in one of these important roles. Jose Molina, currently the minor-league catching coordinator for the Angels, would check both of the last two boxes mentioned. If the front office is aiming for experience and elder statesmanship, they could look toward Edwin Rodriguez. The 58-year-old started his post-playing career as a scout with the Twins back in 1989. He's managed all over in the minors and is currently doing so at San Diego's Class-A affiliate. Rodriguez was interim skipper in Miami for a spell back in 2010. Oh, and he was also manager of the Appalachian League's Princeton Devil Rays in 2000, when a teenager by the name of Rocco Baldelli was breaking into pro baseball for the first time. This is a relatively new position around the league, and it doesn't technically exist on the Twins' staff, but seems to be the rough equivalent of what Jeff Pickler was doing under the bland title of "Major League Coach." Pickler won't be back in that capacity, though there are rumblings he'll land in Minnesota's front office. It's not clear the Twins will fill this position, but I'm guessing they will. The choice could very well end up being someone most of us have never heard before. One name to keep an eye on is Mark Kotsay, currently the quality control coach for an Oakland team that blew everyone away with its quality this year. Kotsay and Baldelli were teammates in Boston back in '09. I just read recently where Roco was looking to add a Latin influence to his staff and felt it was important to do so. Latin doesn't matter unless he is also a good coach and communicator. But I'm really glad Roco understands this need. I honestly don't know enough about Shelton to know if he's the right choice as bench coach or not. But with at least some experience as a manager, a relationship with Baldelli already, it could be a fit. If not, I keep trying to think of a Gardenhire-type. A guy who has been there, done that, and can offer experience. I know next to nothing about Hernandez. But I have been impressed with Rowson. The Twins offense in 2017 was credited a lot to him. And I was really impressed when he spoke about individual teaching and approach with individual players. Through the cluster-muck that was injury and general weird stuff of 2018, I never felt he was responsible for a decline, after the aforementioned incline, of offensive production in 2017. Totally on mark with Willis or Nagy as pitching coach options. Both have impressive ML and coaching resumes. Both guys knew, or learned, how to "pitch" in their careers. Honestly, I'd be happy with Both! One as pitching coach, one as BP coach, working together. *Side note: What are Nathan and Aguillera doing these days? I have no idea. Are they even in the game? Considering their career success, and how they achieved it, Twins legacy or not, couldnt either of them be a quality darkhorse BP coach candidate? I think Watkins has a real future with the organization. But like a prospect climbing the ladder, is it his time now? Gut reaction...no...not yet. Give him a little more time yet to coach and manage. The one thing...OK, there was more than one thing...that bothered me about Molitor was how he was so successful in his career doing the little things that didn't always translate to his team. Before 2018 began, someone, somewhere, forget which "expert" site spoke about the Twins having one of the fastest teams in the league. Even without Buxton, shouldn't there have been more SB? Shouldn't have just general base running been better? I'm really hoping Roco's choices for 1B and 3B coaches simply work with the talent on hand to make smarter choices, but also do a better job of instructing base running and base stealing. Want an advantage over everyone else? Run the bases and steal bases mkre efficiently when the long ball isn't in play. I also hope one of the hires is a catching coach. Whether he is also a coach on the field or not doesn't matter. And this is where I begin to wonder if Giminez, as mentioned in the post, might have been brought back. A transitional acquire by the FO to move him to coaching, post career. Should he cut his teeth in the minors as a coach or instructor I don't know. But I think jts an interesting discussion. Garver, and Astudillo, could continue to learn a lot from a healthy Castro. But he is still a player, not a coach. And this is a very important position to fill, IMO, not just for the position itself defensively, but because this spot also can/Should work so closely with the pitching staff as well. Coaches are always a mystery - who they are, how good they are at teaching and counseling - so I do not have much to add on most individuals.As a purely result angle the coach I thought most likely to go would have been Rowson, but I must have missed some key result. The World Series strategy I hope that can translate to the Twins was the Red Sox approach - two strike hitting, speed and aggressiveness on the bases, reduced strike outs.Forget the "new" pitching ideas - getting on base and scoring is still the name of the game. In DocBauer's first paragraph, he says "Latin doesn't matter" and I agree 100%. No one speaks Latin anyway. Even in ancient Rome, the citizens spoke Greek and only used Latin for writing. Enough talk about Latin. Now Spanish I could see. I understand that Rocco does believe Latin matters, and not about the language.With all the Latin players in the organization and on the team, they need a coach who can relate to their culture, life style, what they go thru in the off season, how they relate to living in the U.S.Its all different for them and having at least one coach who has lived it makes a ton of sense. I understand that Rocco does believe Latin matters, and not about the language. With all the Latin players in the organization and on the team, they need a coach who can relate to their culture, life style, what they go thru in the off season, how they relate to living in the U.S. Its all different for them and having at least one coach who has lived it makes a ton of sense. What a great way to answer the demand of all Twins fans: to bring back bring back Matt Belisle and Chris Gimenez! As long as they're not on the active player roster I don't see why anyone would have a problem with it. Minor, possibly irrelevant note: Our friend Nathan responded to a tweet from Seth about this article saying "I like the idea of Gimenez as 1B coach" and Gimenez himself 'liked' the tweet. So, for whatever that's worth; again, probably nothing. Great posting - do not get your tongue stuck in your cheek! Was always a fan of Chuck Nagy on the hill - he was a battler, got hit around a lot, but dug in his heels the found success more often than not. Kind of Cleveland's version of Brad Radke. Doug Bernier. Hey give a job to Mike Redmond. Sounds like Chris Woodward is getting the Rangers job. Hopefully that means Shelton is coming back. I tried adding smiley faces but they didn't show up. Oh, lord, are we going to have to endure years of people not being able to spell Rocco? See that the Twins lost minor league hitting coordinator Rick Eckstein to the Pirates coaching staff. Do we expect a sjakeup in the minor leagues, still. Lots of new names (many from outside pro baseball) added last season. Not to mention any front office moves. Been a couple of season advancing people to "senior" or "consulting" positions. Is the Twins-extended family in for even more changes?